The railroad industry is already very familiar with electric transportation. Trains throughout the world are powered by batteries, as well as conventional energy solutions, but soon these trains could be powered by hydrogen fuel cells. Fuel cells have begun to establish a strong presence in the public transportation space. These energy systems have garnered acclaim because of their high efficiency and their performance capabilities. Alstom, rail-equipment manufacturer based in France, believes that hydrogen fuel cells may be the future of transport via train. The company has unveiled its first hydrogen-powered train, which is called the Coradia iLint. It is based on an existing train model that Alstom has already developed. Alstom plans to put the new hydrogen-powered train into service in December of 2017. The train will initially be launched in Germany, where a comprehensive hydrogen fuel infrastructure has been taking form. Not only will Alstom be offering a hydrogen-powered train, the company will also offer its customers maintenance service for these trains. Alstom will also aid in the installation of new hydrogen fuel stations, which will be used to power the trains. When Alstom’s new train begins service in Germany, the hydrogen fuel it consumes will be produced through the consumption of waste products generated by the local chemical industry. Hydrogen fuel has been gaining prominence in Germany. 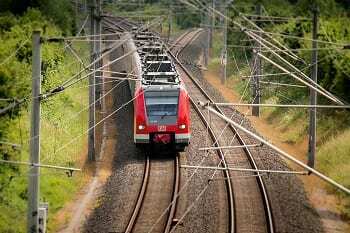 In 2014, three German states expressed their interest in using hydrogen-powered trains. This interest has not been ignored by railway companies, which are growing more invested in hydrogen fuel cells. The attraction to fuel cells has been growing due to increasing emission regulations coming from prominent governments throughout the world. Fuel cells produce no harmful emissions and consume hydrogen fuel in order to generate electricity.